Weasel's Journey: Gathering of blog friends. Last night my friend Hopsy from Monograms and Manicures organized a gathering of her blog readers in Dallas. It was a pleasure to see Hopsy, as well as my friend Jill from Tickled Pink and Green again, and to meet Meredith, Ashleigh from Call the Preppies In and Emily from Champagne and Cupcakes. We had a great visit and are already planning a summer get-together. I hope others will be able to join us then! So sorry I missed it!! Hopefully this Summer? How fun! There are so many bloggy friends I'd love to meet (including you)! What fun! So sorry I wasn't able to make it (finals week). I can't wait until you do it again! I had such fun last night and just wish we could all have stayed longer! A summer gathering is a must, July perhaps? What a fun get together...wish I lived in TX! It was wonderful to meet you the other night! 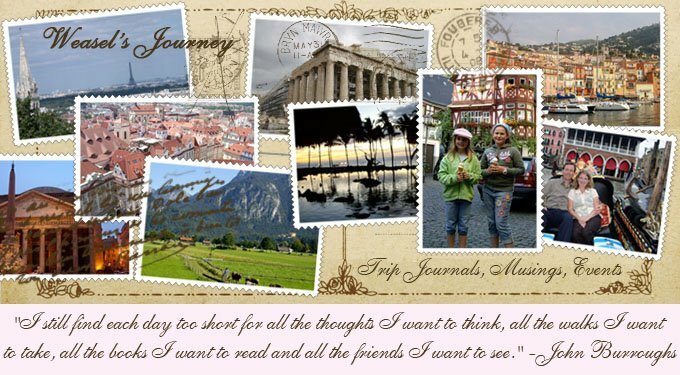 BTW you blog is so cute and I love the pics of your family and travels! Hopefully, we can do another gathering later in the summer. That is too fun! I need to meet my fellow bloggers in lA! Oh that looks like SO much fun!!! Sorry I have ot been over to visit in a while...life has been CRAZY!